Singer-songwriter, testing out her pen. "Trump won 62% of the white female voters without college degrees, while Clinton won 34%." Kind of blows my mind that ANY woman would pass on this opportunity to elevate her gender. Can you imagine the reaction of the Suffragettes - writhing in their graves, shaking their bony, dust-drenched skulls in disbelief. How many suffered for that basic human right? 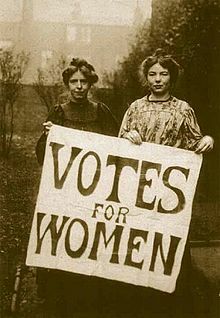 It took America until 1920 to grant women the right to vote, 27 years after New Zealand first granted voting rights to their women in 1893. 27 years! For those of you who voted for the fringe in quiet protest, or not so quiet protest - do you believe in yourselves enough to even recognize what just happened? What kind of opportunity for advancement just slipped by? Did you really just vote against yourselves?? Thank you, Hillary Clinton, for keeping the dream alive. So close to lifting the glass ceiling for women in America. So close! After recovering from my own personal heartbreak & disbelief, I started to recognize where I'm responsible for this. The night before the election I received a note from a distant female cousin, in support of Trump and his last minute Facebook share campaign. I thought about writing her back, and explaining my views about women voting for Trump - but I didn't. I sent over a cheeky "#Imwithher" hashtag, just to not get "into it" & I dismissed her as backward & uninformed. These cousins also post anti-gay comments on their pages, forgetting the message that Harvey Milk taught. "All men are created equal. No matter how hard they try, they can never erase those words. That is what America is about." The Trump campaign played on everyone's fears. Even semi-educated women, some gay, some dabblers, many straight, living in Southern CA put political and religious beliefs before the women's rights issues. I can only put all this back on education. Institutional education and life experience education. I was recently back in NJ visiting my family of origin, only to see a Trump sign on every other lawn in my childhood neighborhood. Thank God NJ saved face with enough forward thinkers to vote for Clinton. A small personal victory for me. So fortunate have I been, spending my life thus far living on the most open minded coasts of this great country. What resonates so loud and clear today, is my wake up call as a woman. My anti-establishment lifestyle, the voice that I have, as I think out loud about what kind of difference I can make. First off, I have my family & chosen family. I have nieces & friends daughters, growing up in homes with strong female figures. I get to add to their experiences and encourage these girls via my lifestyle choices, how & what I share publicly & privately in an attempt to expand their worlds as unique individuals. Let them know there really are no boundaries to what they can achieve. I was incredibly fortunate to have a father who, unbeknownst to him, raised a very independent thinking woman. Under the guise of our common love of music, he taught me how to fight. How to keep going in the face of rejection and never, ever give up. I'm still standing in a career that I started when I was 13 years old. In a career I have never been "right" for. Never the right age, color, race, gender, writer, performer, genre, trend setter, luck rider or sexual orientation - yet I have had enough confidence in my abilities to disregard the nay sayers & pave my own way. At some point, perhaps even currently, the possibility of Universal flow could break down those boundaries & barriers to dreams I've yet to accomplish. I have already experienced many of my dreams - but there are more. I am keeping my dreams alive. In doing so, I am contributing to my community as a joyful, artistic, every evolving woman, who chooses to live in a glorious state where that's encouraged. I don't perpetuate my fears - I've been taught in this magnificent environment how to get underneath them. Lo and behold, I've witnessed that eventually, one by one, they fall off. Maybe the next time women have this opportunity, enough of us forward thinkers will remind others NOT about their fears, but about their opportunities. Not about what's wrong, but about what's right. Not about going backward, but moving forward into uncharted territories. Trying new things we haven't experienced - like a female President! One who might bring a new level of grace & dignity, and openness, and intelligence, from a woman's perspective, like only a woman can do. Maybe next time, we remind each other of all the possibilities. Maybe next time, we vote for expansion. Maybe next time we vote for people, and not just what's in or out of our pockets. Maybe next time we vote for someone whose agenda isn't about eliminating rights, but about creating new ones.